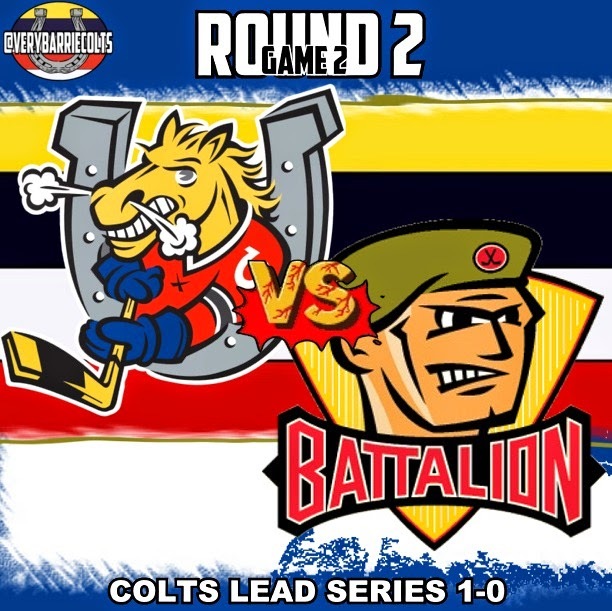 Game Preview: @OHLBarrieColts vs @OHLBattalion Game 2. #OHL #Playoffs - Very Barrie Colts | A website covering the Barrie Colts of the OHL. Tonight is Game 2 of the OHL Eastern Conference Semi Finals between the Barrie Colts and the North Bay Battalion. Barrie currently leads the series 1-0 following a 3-2 win on Friday night at Barrie Molson Centre. It will be the second game since Brendan Lemieux returned to the lineup after missing some time with a hand injury. Though he was out for a good stretch he jumped into the game like he didn't miss a step. I would look for him to log more minutes in tonight's game. Barrie came out strong in the first two periods against North Bay. It wasn't until the 3rd period that North Bay started to look like the stronger team. Colts out shot the Battalion 28-25 after the first two frames but were out shot 11-2 in the 3rd. Luckily for the Colts, Joseph Blandisi managed to score the game winning goal on one of those two shots. Mackenzie Blackwood had a huge night for the Colts and no doubt was a huge reason they got out of the 3rd period with the win. He managed to do what he has done all season and use his size to block the net. No frantic movements, just good positioning and making himself big. If he can continue with that there is no reason that the Colts cant leave game 2 with the win. Rasmus Andersson had a great game. Though, he was the only Colt with a negative +/- (-1), his work on the blue line shows why he has been one of the top blue liners of the season in the OHL. He does a great job of pinching along the boards, moving the puck in the offensive zone and making sure he gets back quickly when play turns the other way. This is a huge game for Barrie. Losing tonight is the same as losing home ice advantage. If the Colts win tonight, it is a massive advantage heading into North Bay with a 2-0 lead in this series. Keys to success: Though Blandisi had a mostly good game (and scored the game winning goal) he also got 3 minor penalties. The officials seem to be calling a more laid back game compared to the Belleville series but we can't take advantage of that. Just because they are calling less penalties doesn't mean we can afford to get carried away. Brendan Lemieux showed great discipline. There were multiple times where Battalion players tried getting under his skin and he would just skate away. Lets hope that he carries that into tonight and is able to set an example for the rest of the team. Players to Watch: Mackenzie Blackwood will need to keep up his play and is always work keeping an eye on. I expect that Garrett Hooey will also have a huge night. Though, with Lemieux returning we see less ice time for Garrett with Brendan taking his spot back on the top power play unit. That being said, I expect Hooey to make the best of all shifts and will want to show that he deserves to be on that top PP line. Jonny Laser also is a player to watch. He is the leader on the blue line and after scoring his second goal of the playoffs in game 1 I would expect his confidence is up and that should reflect through the entire lineup. Puck drop is scheduled for 6:00 pm. We will be in attendance as well so if you want to say hi, send us a tweet and we can make that happen!